As the blustery winter season blows in, Father Tim is struggling with new emotions and unsettling endings. His attractive neighbor Cynthia has become a focal point in his heart and a thorn in his side. The conflicted Father Tim vibrates between adulation and a teen-like angst to be rid of romance and all its demands of commitment and justification. While Father Tim is finding himself surprisingly ready to raise Dooley Barlow, the unloved and fairly wild local child, opening his heart to Cynthia in this new way may not be possible. And yet, he cannot leave her alone, especially when he discovers that his independent neighbor has up and moved – without telling him or leaving any contact information. Will Father Tim’s search for Cynthia, however, hurt two lonely hearts instead of helping them? Romance, wanted or not, is the theme of this soggy season, and compounding his neighbor situation, Father Tim now has an aggressive paramour – a recent widow with a penchant for casseroles and forceful seduction. Wending his way through Mitford and church functions in an attempt to avoid her, however, becomes difficult when she uses her local power to exact the ultimate revenge: shutting down the Grill. Can Father Tim find the guts and the wiliness to save his friends and a local centerpiece while warding off this hilarious, albeit crafty suitor? Father Tim, still bustling from the joy of having reconnected with his Irish roots, and hence family, soon discovers that the joy of newfound heritage has its own sting. Sloppy and sullen Cousin Meg, a long-lost relative whom he must have met during his recent journey to Ireland (was it at that luncheon?) has taken the stricture of hospitality to the max, showing up sans warning and with baggage. Behind constantly locked doors, the endless thudding of her type-writer (apparently, part of an extensive family history in the making) and the enigmatic midnight food thefts leave both Father Tim and Dooley desperate for a home devoid of guests. 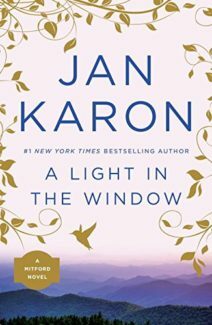 A Light in the Window is about the big and little moments in real life and how they intertwine through the quiet days and ruminative nights to create a narrative sometimes sad, sometimes happy, and sometimes, simply confused or longing. As with At Home in Mitford the cozy atmosphere is fostered by attention to detail, some comforting down-home life, and an unfailing attachment to individual characters. While Father Tim himself gets a little frustrating in A Light in the Window, being a 60+ year-old man with a distinct reaction to women and romance that seems immature (the word “cooties” isn’t far from our minds), everyone is just as lovable, complex, and warmly inviting as always. The addition of more struggles, and deeper revelations, coats the novel with the realism that, while it can be a downer at times (i.e. learning of Cynthia’s horrible marriage, seeing characters hurt by love or fear) this openness makes everything more cozy and more meaningful. I use cozy in the sense not of sugar-coated rosy tinted perceptions of life, more akin to a child’s novel or a Beatrix Potter adventure, but cozy in a semi-nostalgic sense with that indefinable ingredient that closeness to others, even during times of trauma, is “cozy” in that there is comfort and healing in deep attachment. Beyond Cynthia, Father Tim, and Dooley, the usual cast of characters is vibrantly alive and painstakingly developed. Miss Sadie’s story of her childhood and the artist who painted a cherub on the wall of her estate’s ballroom is hauntingly memorable and deeply effecting. Uncle Billy has a joke for every day and situation (proper or not!) and Miss Rose’s unique wardrobe makes its usual debut. Hoppy and Oliva continue to find hope in a new heart; Stuart Cullen exasperatedly gives Tim some much needed relationship advice. Percy Mosley is attempting to find a future outside the Grill, but at his age a new job (and a new direction!) seem more like a death sentence than a chance to experience God’s mercy. Meanwhile, Puny Bradshaw gets her own made-to-order parade, and the village comes up with the idea that having someone push a peanut with their nose up main street is just the thing for waning tourism. Only Barnabas remains disinterested. With so many things going on, and such a changing scenery of hope, memory, and snowstorms, A Light in the Window keeps the relaxed Mitford pace and feel while covering a lot of emotional and developmental ground. What I found myself rebelling against was Father Tim himself. His mistreatment of Cynthia, albeit unintentional, conflicts with his wise persona. Of course, it shows that Father Tim, like everyone, is flawed and while he may be advanced in years, and seemingly wisdom, is still capable of common follies, it doesn’t help readers to like him very much. I admit that in some instances I wanted Cynthia (or Jan Karon on her behalf) to give Father Tim a good talking to and to cease the patience. Father Tim, you are not a tween. Please stop treating the admirable Cynthia who is both loving and emotionally fragile, with such impunity! Of course, this on-again off-again relationship has the feeling of something that is going to be episodic in nature so it’s both with relief and annoyance that the conclusion wraps up all the back-and-forth. It’s a relief that we won’t have to continue watching two beloved characters in what ultimately seems like unnecessary turmoil, but the way we get to the resolution is too brisk and there is no satisfaction, largely because there was no ground-work. Dues-ex machina may work for the ancient Greeks, but in Mitford we want to be along for the ride and see the transition. Otherwise, this installation in the Mitford series remains true to everything we know and love of Jan Karon’s world. The characters, the situations, and the place continue to grow, expanding further into readers’ hearts and leaving us anxious to dive into the next Mitford adventure.